Have you ever faced sleeping problems when you go camping? That’s probably because the sleeping mat you brought with you didn’t provide you comfort. That’s why you need some change for your next adventure. The camping air mattress is the better solution than the sleeping mat you owned since it is more convenient, more comfortable and durable. It is just the perfect equipment you should have on your next journey. To guide you in choosing the comfortable air mattress, we would like to introduce to you the top 10 best camping air mattresses in 2019. Read on to find out what these camping air mattresses can offer. 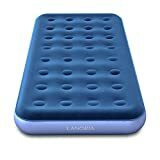 Starting with LANGRIA Air Mattress which is one of the best air mattresses on the list. This mattress allows you the have a comfortable sleep with its twin size which is just right for one or two people. It is designed with 32 circular coils in order to ensure the durability and provide you the comfort sleep. On the top of the mattress, there is a layer that is made of flocked PVC material that is to resist water, and this material also has the soft touch to provide you the best sleep ever. Moreover, the LANGRIA also comes with the storage bag for you to store it and easily carry it around when you go on your next camping. Inside the carry bag, there is a repair kit for you in case some malfunction problems occur during the camping. Furthermore, it also comes with the handheld electric to inflate the mattress for only 2 minutes which is very quick and convenient. Another top rated product is from Therm-a-Rest. 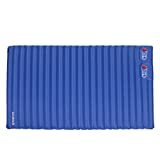 This camping air mattress has the luxury self-inflating foam technology to provide you comfort and warmth during your camping especially on the hill or on the mountain. 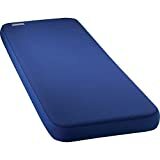 More than that, this air mattress also can be used at home too which is very convenient for everyone. Looking at the thickness of this mattress, it is 4 inches thick with the size of 30 x 80 inches to make sure that you get the most comfortable and warmest sleep possible during the camping. Furthermore, you can adjust the firmness of this mattress by just inflate or deflate the air from this mattress to fit your preference. This best blow up mattress also comes with the carrying handle for portable use and easy to carry around when you go on your next adventure. Moving on to another product on our list is the air mattress from Sable. 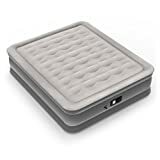 This is the adjustable air mattress that will provide the stability and comfort during your sleep. Moreover, the coil beam of this mattress will help you get the perfect sleep during the camping. This mattress also features the electric pump for you to inflate the air into the mattress with the incredible speed for only 5mn for the full capacity of the queen size mattress. After you’re done using it, you also can deflate it back to save space with its foldable design. Also, with this design, you can easily bring it for your next adventure. Furthermore, this mattress can support the weight up to 660 lbs which is very convenient for the camping equipment. Another Sable Air Mattress is on our list again. This is a smaller sized air mattress than the previous one. This mattress is constructed with the wave beam to help you get the perfect sleep during the night and help provide the stability for the sleep surface. You can save space when you are done using it by deflating the air from this mattress. With the deflating feature of this mattress, you can easily bring it to every adventure you go to along with its own carry bag. Moreover, this mattress also comes with the electric pump to inflate air to this mattress for only 3 minutes to the full capacity. Moving on to another top rated product which is the Ancheer car mattress. This is the car air mattress which differs from the previous products on our air mattress reviews list. During the camping, a car can be where you sleep too and with the regular seat, you won’t be able to get the comfortable sleep. This mattress is made of high-quality PVC to ensure the durability and comfort. On the top layer of this mattress, it is sleek black flocked to provide the soft touch that can transform you back seat in to a luxury bed. Next, we have another top rated product from KingCamp. 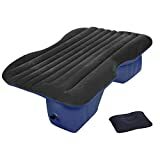 This is the air mattress that looks like a sleeping mat to give you the original taste of camping. With the single size, this mattress is the perfect fit for those who like to travel alone and meet a lot of new people. It is made of 190T polyester which is durable and can resist water well. Moreover, this mattress is built-in with the foot pump which is very easy to inflate which take you only 2 minutes to inflate the air into the mattress to its full capacity. The design pattern of this mattress makes it easier to fold and with its lightweight, you can easily bring it when you go on an adventure. Moving to another product which is from Therm-a-Rest again. This mattress is made of 75d polyester which is durable as well as waterproof that eases your concern when camping under any kind of weather. In addition, this mattress is light and soft – thanks to the plush fabric for making this sleeping pad remarkably comfortable. 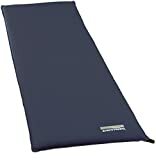 Moreover, the thickness of this sleeping pad is 2 inches thick which is just right to provide you maximum warmth. Furthermore, it is a self-inflating air mattress due to its compressible foam core. The top 3rd air mattress on our list is from Airlite. This mattress has the compact size to ease your concern over the space limit. With its tubular design, it allows you to pack it up easily and provide you an incredible sleep at night. This portable design on this mattress is made for the needs of the outdoor experience like camping. Moreover, this mattress is also built-in with the foot pump to give you an easy way to inflate the air into the mattress. In addition, it is made of diamond ripstop fabric which is durable and you can use it for years. SoundAsleep has come into 2nd place on our best mattress list. This air mattress equipped with the ComfortCoil Technology and the I-Beam Air Coil plus the Eco-Friendly PVC which is the provide you the durability of your wilderness camp-outs on the weekend with your friends or family. This mattress is also packed with the external pump which is unbelievably strong to give you the quick inflation. This mattress only takes 3 minutes to fill the air to its full capacity and it suits with the outdoor camping due to its extra thick material which is an ideal choice for every camper. Saving the best for the last, this is the Lightspeed Outdoor Air Bed. The inflated size of this mattress is 77.9″ x 55.9″ x 8″ and it also built-in the pillow to make it the best air mattress and the top of our list. Moreover, this air mattress has no plastic smell which gives the perfect sleep at night inside the wilderness. In addition, with the turf tech non-slip surface, this enhances the comfort of this mattress to another level. 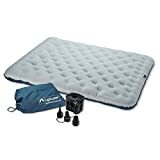 This air mattress will give the best experience when you go on your next adventure with your companion. After going through all the air mattresses, we believe that you should be able to have better choices when it comes to choosing the air mattress for your next adventure. With these mattresses, they will take your camping experience to another level. If you still haven’t owned one, grab yours now and get the best sleeping experience in the wild. Oh don’t forget to consider other tools such as backpacking tent or camping tent, camping cot, camping table & wearable sleeping bag as well.